The Telangana State Veterinary University has published the polytechnic admission notification 2017 for Admission into two years Animal Husbandry and Fisheries polytechnic Diploma courses for the academic year 2017-18 and the TSVU invites the application forms from the eligible candidates in the prescribed proforma for admission into A.H. and Fishery courses. TSVU Polytechnic Diploma Programmes Admissions Counselling dates, Selection list, list of documents for Certificates verification 2017 details time to time would be provided here. 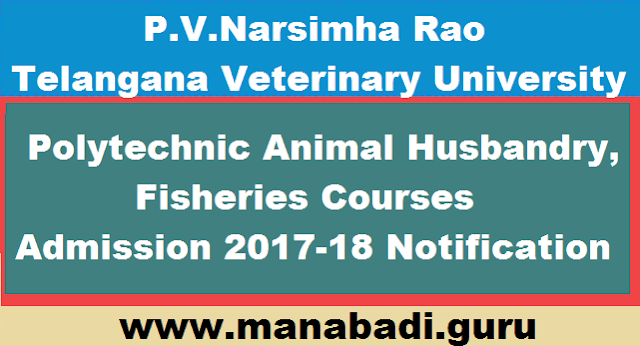 So, Two year Diploma in Animal Husbandry is offered at the Animal Husbandry Polytechnics and two year Diploma in Fisheries is offered at the Fisheries Polytechnic. The Candidates age limit must have between 15 to 22 years as on 31.08.2017.